Our National Trust membership lapsed more or less at the time of our planned visit to the Homewood (I say planned because this is a rarity which you need to book in advance). The two hours we spent absorbing the story, detail and beauty behind the building meant we’d signed up to another years membership upon leaving! 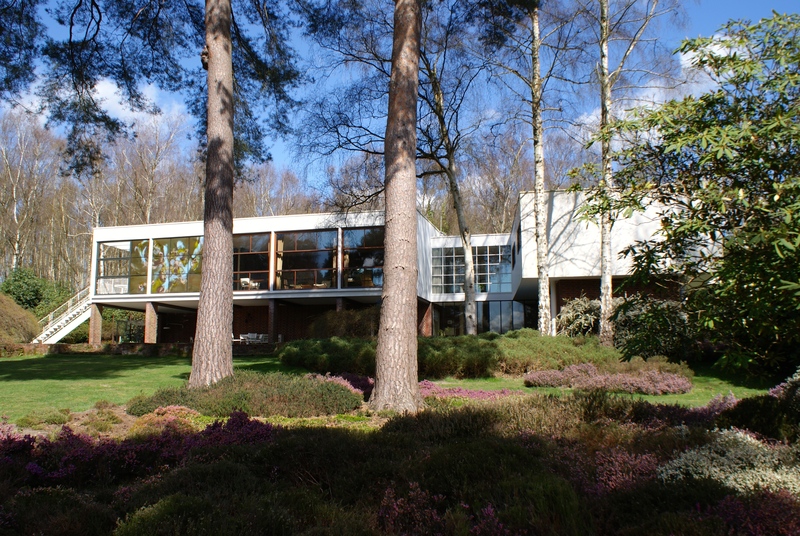 The villa, situated in Surrey, was completed in the early summer of 1938 – a true modernist masterpiece. On arrival, you are met by guides each more enthusiastic and knowledgable than the last, many of which had met the original owner and architect Patrick Gwynne and were truly fascinating sources of information. The villa first caught our eye when it was covered in an article in Midcentury Magazine, a reminder of a striking interior we’d seen used as a location, but the programme name still evades us! On the short bus ride with around 10 others we’re told that we were the first tour of 2015 – if we didn’t already feel keen then we definitely looked it! 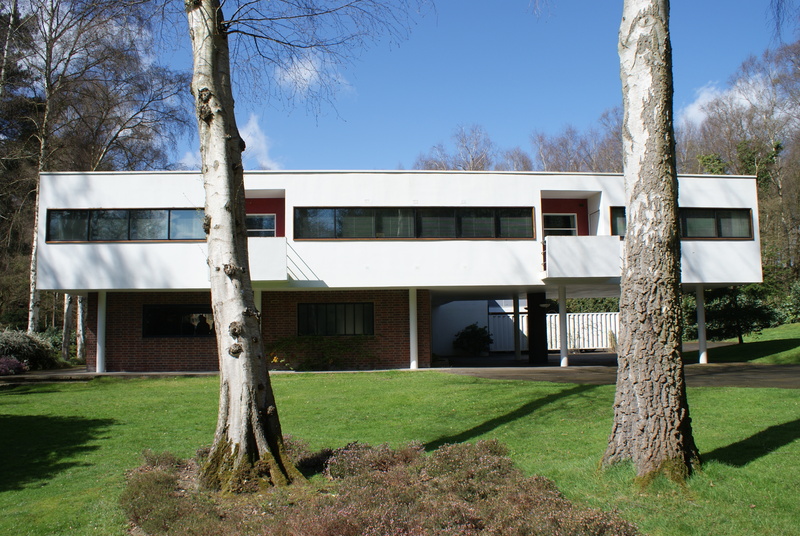 You arrive down a short drive, off a busy road, to a very modernist looking abode. It is unbelievably crisp looking and the railings, catching the light, form lined shadows reminding us of a ship. We don’t shake that first impression. Standing outside we marvel at the fact it’s essentially a bungalow on stilts. 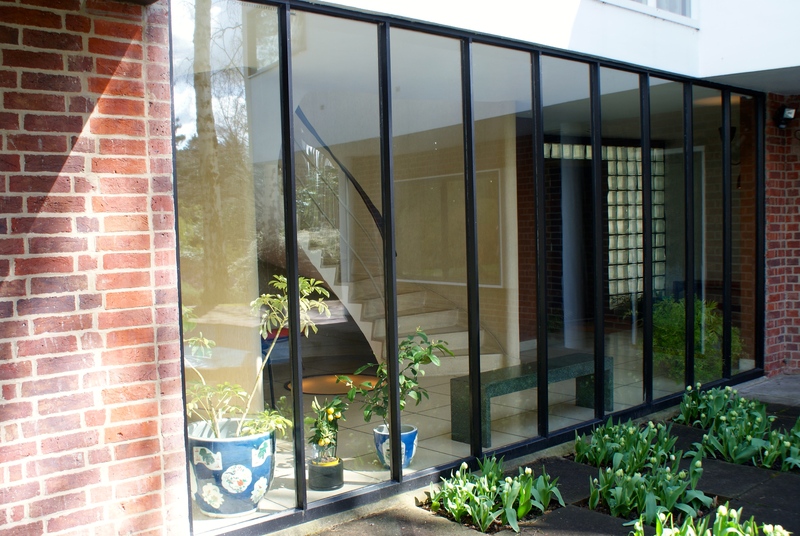 Yet the undercarriage of the house is used so cleverly – for a drive-under porch to the front door, with lots of glass bricks used underneath to flood the space with light and planting which extends indoors for an indoor/outdoor feel. On the garden-side the underside space is used for an outdoor kitchen and terrace – but we’ll get to that! The first room you explore is Patrick’s study which is off a small hall and is really James Bond / Star Trek in disguise – all cantilevered sideboards, pop out cupboards in every size, leather tables with wings.. He appeared not to like his furniture to touch the floor ever and it gives for a very ordered and calming feel. Dual aspect windows provide light, greenery and views to who was arriving on one side, and the garden on the other, making it an enviable space to work from. We spent some time in the study discovering the reason the family destroyed a (very beautiful) Victorian country home on the plot and sold a whole street of houses to pay for this daring new build by their 24 year old son. It cost £10,500 to build and as it states in the NT’s The Homewood book ‘the house is based on Gwynne’s own system of proportion: the vertical unit is 1ft8in, the horizontal 4ft. Everything is a mathematical variation on this theme and this rational aesthetic gives the garden front its harmonious beauty’. Impressively, Patrick built the home in little over a year, but just 18 months into life there WWII broke out. Each family member did their duty, but both parents died of natural causes during the war, the daughter married on return and Patrick ended up back at the house several years later in 1945 on his own. The fact is, he worked and lived from The Homewood his entire life, dying aged 90 in 2003. It is a perfect example of modernism, with some 70’s add ons such as orange paint and an outside dishwasher! He integrated hot plates into the slate tables using the table legs to hide power cables which he couldn’t abide. 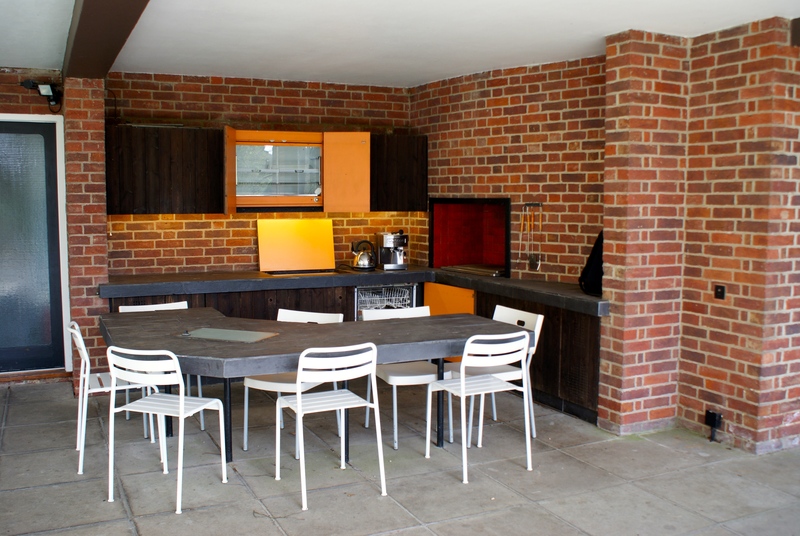 He even encompassed a chimney for a large hotplate in the outdoor kitchen which he could sit next to on the roof terrace on those bright but not-so-warm English days providing warm air whilst he sunbathed! Walking around the house, yes it was a house built for parties with mirrored and leather walls(! ), an enormous sprung floored ‘deck’ of a sitting room with a built-in gramophone and tables that lit up – but it was also an investment in craftsmanship. He had faith in cutting-edge materials and this makes the house and gardens all the more surprising and enjoyable. There is a modest swimming pool next to the outdoor kitchen with little ponds surrounding it with lily pads and goldfish in. This was a house for living, one he refurbished occasionally but essentially never had to update, and this makes it all the more remarkable. Patrick removed great swathes of the formal gardens which accompanied the Victorian family home and created wide sweeping vistas with grassy green paths that seem to disappear into the plot. Huge beds of heather and silver birches (even an ancient redwood) all lopped off at lower level, afford views to the house and back again. Patrick wanted the planting to be what would locally be found in the area, and apparently dug up huge clumps of heathers from the local area (which of course today would be much frowned upon!) but he did have a point – it would grow abundantly without much maintenance. You might spy in the above photograph a giant square of artwork on the building (on the left hand side next to the large windows). Stefan Knapp‘s enamel panels used the same sizing principles as the build itself, and if you look at the reflections in those neighbouring windows, you’ll see his inspiration of reflected blue skies and green foliage. 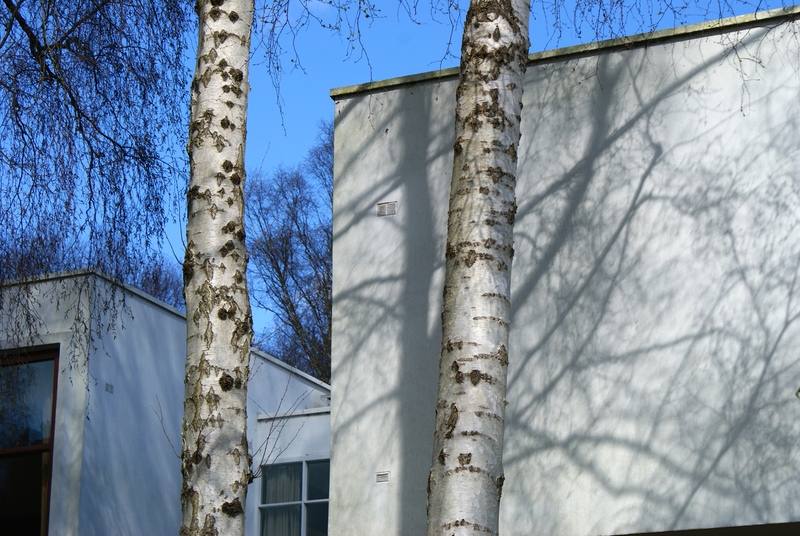 The tall silver birches also provide fantastic contrast against the house which is still a crisp white and Patrick incorporated some sculpture, mosaics and hard landscaping outdoors to explore too. The house is tenanted, as was Patrick’s wish, so one lucky family has been living there for the past 8 years. In actual fact we only see around half of The Homewood, which is open to the public – but it is magnificent, friendly, energetic, playful and aspirational. Of course there are original Eames chairs, bespoke pop-out cocktail bars, drawings and chandeliers to marvel at but it’s the careful use of materials which is so aesthetically appealing. There is no getting away from the fact these were wealthy people enjoying the good life – but what a feat to have built what they did when they did – what fearlessness. Of course post-WWII there wasn’t such a thing as ‘Starchitects’ like we have now. Patrick didn’t have a lot of other opportunity for building one off experimental private homes. He did build a handful of beautiful public buildings though such as The Theatre Royal in York, The Crescent restaurant at the Festival of Britain and The Serpentine restaurant in Hyde Park which was sadly pulled down in 1989. 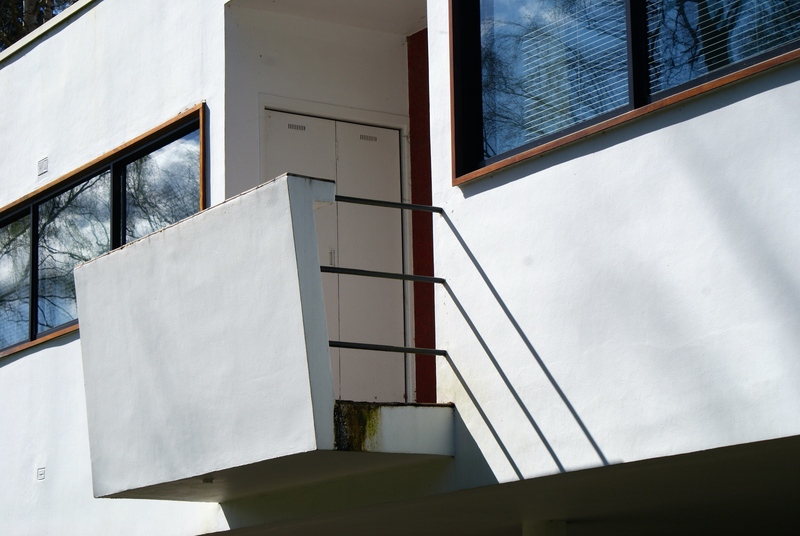 If you’re looking for intelligent, multi-functional, well-thought-out design which hasn’t been ‘modernised’ by later generations of homeowners then this is the rare UK modernist gem for you! Tours run on alternate Fridays and Saturdays between April – October departing from the stunning Claremont Landscape Garden. Enjoy – we’ll most definitely be back!